The Philippines could soon emerge as a major supplier of energy efficient trains following the recent unveiling and testing of a Philippine-made hybrid electric train. Developed by a team of Filipino engineers and technicians at the Department of Science and Technology’s (DOSTs) Metals Industry Research and Development Center (MIRDC), the P120 million (US$2.5 million) energy efficient train commenced development in 2013. Last month the DOST rolled out the first prototype at the Philippine National Railways (PNR) Tutuban station, with then-DOST secretary Mario Montejo noting that the end result showed that the Philippines is not lacking in engineering talent and capabilities. “It’s high time we gave recognition to the fact that we are fortunate to have the best engineering and technical minds in the country”, Mr Montejo said. Comprising five air-conditioned coaches capable of accommodating up to 220 passengers each, the DOST Electric Hybrid Train (EHT) is said to consumes up to 50 per cent less fuel than conventional diesel locomotives as a result of power being shared 50:50 between batteries and the diesel engine. The DOST-MIRDC Electric Hybrid Train (EHT) undergoing testing. According to EHT project leader Pablo Acuin, power starts flowing from the train’s battery once the 500 kilowatt genset reaches 200 kilowatts. The batteries receive charge every time the train’s brakes are applied. After a testing stage the train will be introduced into service on the 56km long PNR Southrail route connecting Tutuban and Calamba stations, though poorly maintained track is expected to prevent the train from running at it’s maximum speed of up to 80kph (50mph). According to Mr Montejo, at least ten local companies are “interested” in the DOST Electric Hybrid Train, not the least being PNR which has a budget of around P2 billion ($43 million) for 2017. 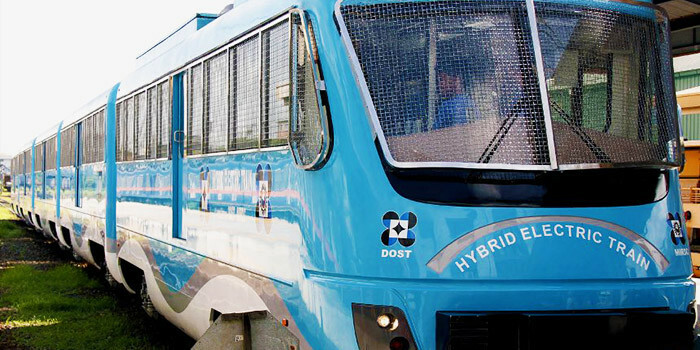 The DOST Electric Hybrid Train is the third ‘train’ project undertaken by DOST and follows the development of a ‘Hybrid Electric Road Train’ which went into testing late last year, and a ‘monorail’ system which was built on the University of the Philippines Diliman campus in 2012. While neither of the two earlier DOST projects have yet to enter commercial production, MRail, a subsidiary of Manila Electric Co., is believed to have committed to mass producing the DOST road train once it passes a series of intensive tests and receives certification. If commercial backing for the DOST EHT can be realised it could spur the development of an entirely new niche industry for the Philippines. Currently there are very few companies in Southeast Asia with the capability to manufacture rail transportation equipment, despite the construction of modern mass-transit systems in countries such as Singapore and Thailand. Singapore’s trains are built in China, while trains for Thailand’s BTS ‘Skytrain’ come from Siemens AG of Germany and CNR Changchun Railway Vehicles (CRV), a Chinese joint venture with Canadian Bombardier Transportation. For Manila’s Metro Rail Transit System (MRT-3) a Czech company built and supplied the trains. In Indonesia state-owned PT INKA has been producing locomotives and rolling stock since 1981, while in July last year the manufacturing of electric multiple units (EMUs) and electric locomotives commenced in Batu Gajah, Malaysia with the opening of the China CSR Malaysia Rail Transit Equipment Company by Chinese state-owned rolling train manufacturer CRRC. With an annual capability of 100 trains and employing more than 160 people, the facility hopes to capture a lions share of the Malaysian train and rolling stock market, which the company expects to reach about 1,000 units in the next five years. It predicts a further 2,000 items of rolling stock will by then be requiring maintenance and repair..
Chinese made trains are slated for the $5.1 billion, 150km (93 mile) Bandung-Jakarta high-speed rail link which is expected to commence operation in 2019, while Cambodia has contracted China state-owned China Railway Group (CRG) to build a 400-km (249 mile) link between Preah Vihear and Koh Kong for freight transport. 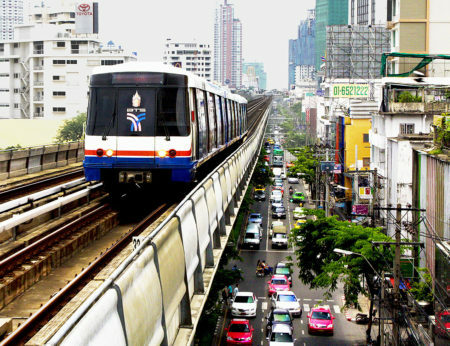 In Vietnam Chinese railway companies are involved in building an urban railway project in Hanoi, while in Ho Chi Minh City Japanese railway companies are building the city’s metro (See: Hanoi & HCMC Metros Struggling to Get on Track). Japanese railway companies are also pushing to take over a railway project in the Philippines that was initially awarded to China in 2004. With President Duterte vowing to fix Manila’s notoriously bad traffic congestion and increasing infrastructure spending by 13.8 per cent in the 2017 budget the timing of a locally-built energy efficient train couldn’t come at a more opportune time. With the right policies and incentives and the Philippines could soon join the ranks of the very few producing trains in Asean.